Feeling overwhelmed by the thought of starting an exercise program? Take a moment to read Lorenzo’s success story! When you decide it’s time to get in shape and lose some weight, it can be hard to figure out where to start. Many people may think they have to buy a gym membership and start logging miles on the treadmill, but Lorenzo would beg to differ. And he should know – Lorenzo has lost an incredible 80 pounds since he began a walking program in July of 2015. Back then, he was prediabetic and struggling with high blood pressure. Then, his doctor gave him a wake-up call. “They said, ‘If you don’t change things, you’re going to be diabetic.’” Lorenzo’s aunt is diabetic, so he knows how the condition affects your life, and he knew he didn’t want to let that happen. Lorenzo played baseball in high school, “I was thin, and I was fit,” he remembers, but says he really hasn’t exercised since. He also admits his eating habits were “really bad,” saying he ate mostly fast food and would stay up until one in the morning, snacking and watching Netflix. 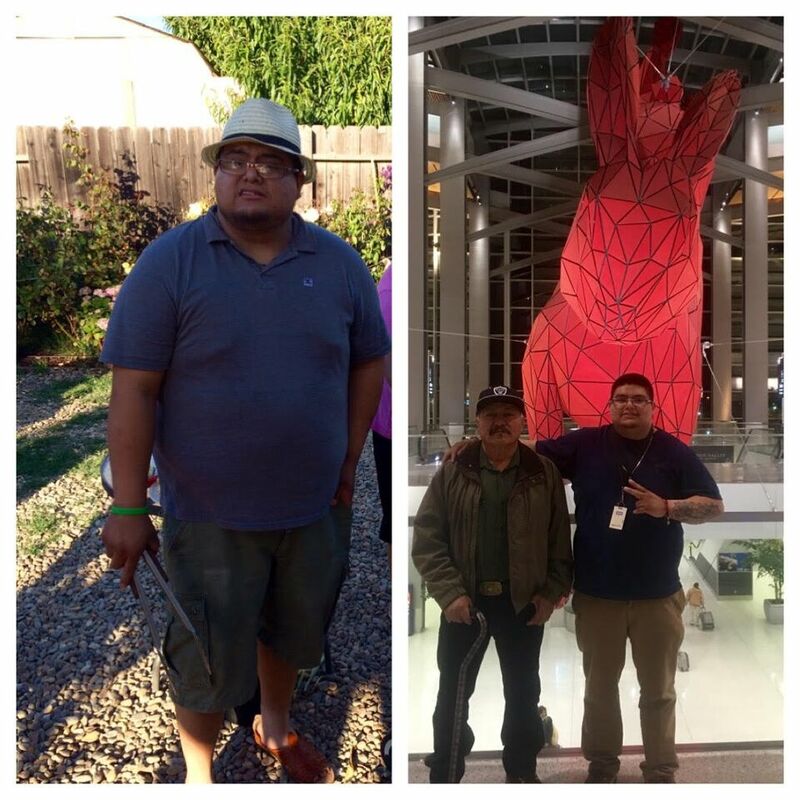 Since embarking on his walking program to lose weight, Lorenzo is also making diet changes. He’s cut out the McDonald’s, the enchiladas, and the frappuccinos – “I have a sweet tooth, he laughs, “I miss my Starbucks.” These days, he occasionally treats himself to a modified version – small, decaf, and soy, but they are no longer a daily indulgence. Soda has been replaced with Crystal Light or water with lemon, and his late night snacking is a thing of the past. When it comes to losing weight, walking may not even come to mind as a method, but it should! “Fast-paced walking, when combined with healthy eating, is hugely effective for weight loss,” says Art Weltman, PhD, director of exercise physiology at the University of Virginia. Pace is key, as Weltman told Health Magazine, “There is a strong relationship between intensity of exercise and fat-burning hormones.” You don’t need to be a crazy race-walker, but you also won’t see many results with a casual window-shopper stroll. Aim for a brisk walk, and, of course, get as many steps in during your normal day-to-day activities as well. Lorenzo meets his daily step goals any way he can. Besides his usual walking program at work and around his neighborhood, he goes to the mall and walks the entire building three or four times. He doesn’t pass up any opportunity to get moving. “I tell my cousins and my sisters, ‘If you guys are going to Costco, hit me up! I’ll come get my steps in!’” Lorenzo wants to lose 40 more pounds to reach his goal weight, and then he plans to add weight lifting and boxing to his exercise regime. For walking program ideas and advice, contact Wellworks For You – tell them Lorenzo sent you.